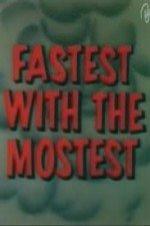 Buy or Rent Fastest with the Mostest (1960) Movie DVD & BluRay Online! Movie Plot: Wile E. Coyote tries to drop a rocket bomb on the Road Runner from a balloon but inflates himself instead, ascends skyward, then falls along with the bomb. He tries painstakingly to deactivate the bomb before it explodes – and fails. His attempt to trap the Road Runner on the edge of a cliff results in the cliff collapsing under his feet, sending him to the ground to be hit by his own knife and fork and then fall into a waterfall leading to a maze of pipes.